Hello everyone and welcome to another tutorial on STYLY! Today, we will be going over the visual aspects of STYLY and create a Virtual Reality Concert. A concert is not a concert without a stage. 3dwarehouse is an excellent database of free 3D models of all kinds. Simply search concert and you will be presented hundreds of concert stage models you can use in STYLY. The model I am going to be working is called aharitola. 3Dwarehouse is associated with the Sketchup Tool and all files downloaded from the 3dWarehouse have .skp file format. To effectively use the models, once downloaded, open it in Sketchup tool. Now simply export it in .fbx format. STYLY does not support all .skp formats and that is why we convert the objects. Now comes the task of creating the audience and the singer of the concert. Many humanoid models are already available on Mixamo. 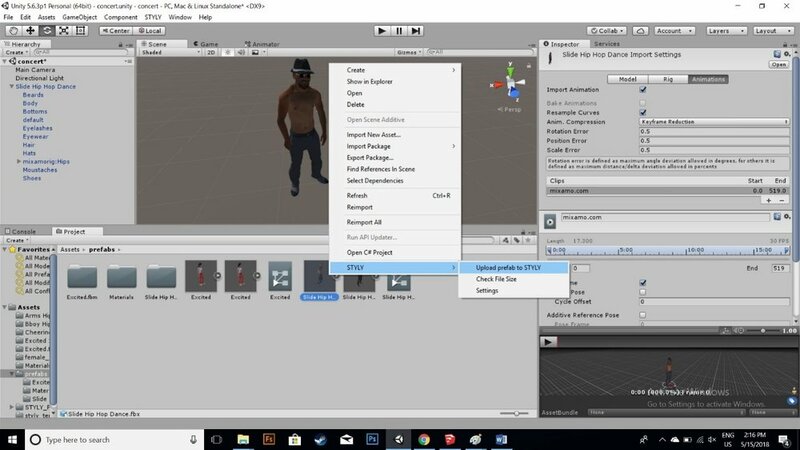 Mixamo allows you to not only download 3D humanoid models, but also allows you to add animations into them. So for creating our own characters I used Adobe Fuse CC. 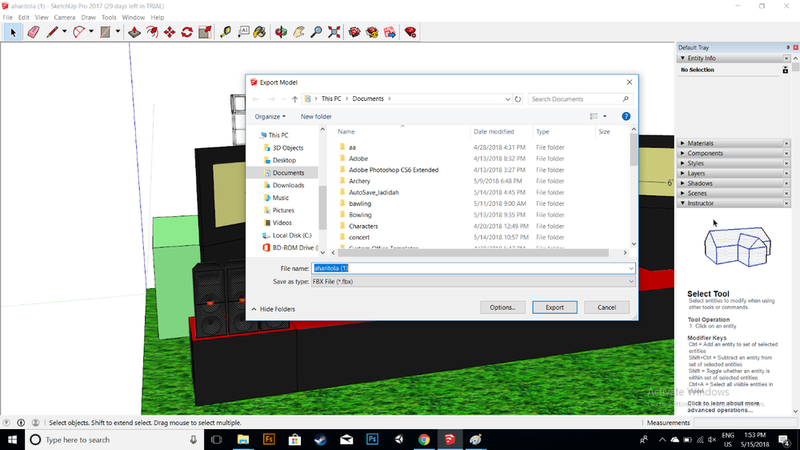 In which you can create your own character’s and then you can send them in Mixamo directly. After that you can add any animation you want so in this added dance and cheering animations. Characters downloaded from Mixamo may be broken models, meaning their texture may not show properly in STYLY, so to counter that, follow the best practice of first adding any model to Unity to clear any rendering issues. Reason for this is so that we can make sure the model is not broken. Sometimes the textures and shaders are not properly applied and need some modification. To handle this issue, simply change all shaders to Legacy Shaders/Bumped Diffuse in all of the parts of the model. Make sure to go through all of its hierarchy. This takes care of any and all texture issues. 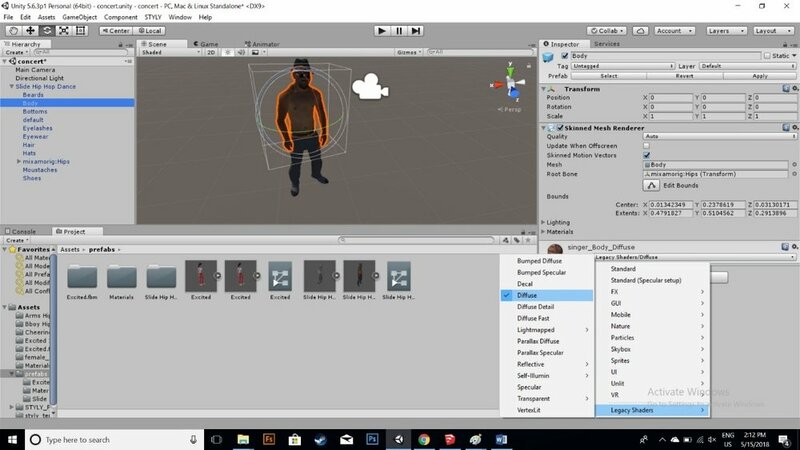 Once the models are set in Unity, upload them to STYLY via the STYLY plugin. Once all the prefabs are uploaded, open up the STYLY EDITOR. We have taken care of most of the content and now we are to setup the environment. 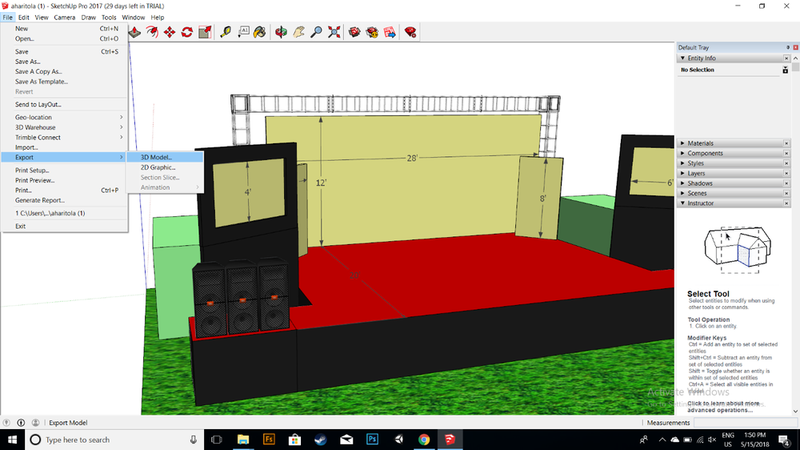 To start off, place the stage and then the uploaded models with animations. Now set up the scene and funk it up. STYLY has a lot of 3D models which you can use to decorate the scene and make it more immersive. Add flashing lights and glowing objects to amaze everyone! STYLY has a search bar in the 3D model tab which you can use to further explore the asset database. As you can see in the snapshots, I have only used STYLY assets to create eye catching environment. This is all that you need to do to create virtual reality environments. Now that you know the basics, let your creativity out and make the best Virtual Reality experience you can to amaze your friends! You can check out a demo video of what I created here. Have Fun! Here’s a video tutorial to help you understand the concept.